Imperata cylindrica Beauv. var. major (Nees.) C. E. Hubb. Botanical Name: Imperata cylindrica Beauv. var. major (Nees.) C. E. Hubb. Common Name: Imperata rhizome, Woody grass. Part Used & Method for Pharmaceutical Preparations: The rhizomes are dug in spring or autumn, cleaned, dried in the sun and cut into small pieces. Meridians: Lung, stomach and urinary bladder. 1. Hemorrhages due to extravasation of blood by heat. 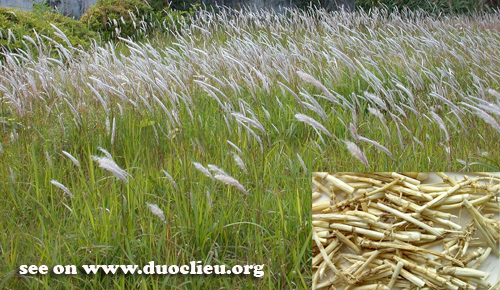 Imperata rhizome (Baimaogen) is used with Biota tops (Cebaiye), Small thistle (Xiaoji) and Cattail pollen (Puhuang). 2. Hot urination, edema and damp-heat jaundice. Imperata rhizome (Baimaogen) is used with Plantain seed (Cheqianzi) and Lysimachia (Jinqiancao). 3. To treat excessive thirst due to febrile disease or vomiting due to stomach-heat, it can be used in combination with reed rhizome, bamboo shavings, ophiopogon root and other herbs for clearing heat, relieving vexation, promoting generation of the body fluid and alleviating thirst. Dosage: 15-30 g (30-60 g, if fresh herb).